American leftists generally focus on redistribution and regulatory intervention and socialism technically means that the government directly owns, operates, and controls various sectors of the economy (think, for example, of the difference between Obamacare and the U.K.’s system, where doctors are public employees and the government operates the hospitals). But we do have a few islands of socialism in the United States. Education is probably the biggest sector of our economy that is dominated by government. The air traffic control system is another unfortunate example. Today, though, let’s focus on the Postal Service. I wrote about this topic a couple of years ago, but we now have lots of additional evidence on why we should replace this costly and inefficient government monopoly with a system based on real competition and no subsidies. My colleague Chris Edwards explains that, from an economic and taxpayer perspective, the postal monopoly is a dumpster fire. The U.S. Postal Service (USPS) has lost more than $50 billion since 2007, even though it enjoys legal monopolies over letters, bulk mail, and access to mailboxes. The USPS has a unionized, bureaucratic, and overpaid workforce. And as a government entity, it pays no income or property taxes, allowing it to compete unfairly with private firms in the package and express delivery businesses. …the USPS needs a major overhaul. It should be privatized and opened to competition. But instead of reform, congressional Republicans are moving forward with legislation that tinkers around the edges. Their bill adjusts retiree health care, hikes stamp prices, and retains six-day delivery despite a 40 percent drop in letter volume since 2000. The bill would also create “new authority to offer non-postal products,” thus threatening to increase the tax-free entity’s unfair competition against private firms. Amazingly, this is an area where European nations actually are more market-oriented than the United States. Republican…timidity is particularly striking when you compare their no-reform bill to the dramatic postal reforms in Europe. …Since 2012 all EU countries have opened their postal industries to competition for all types of mail. A growing number of countries have privatized their postal systems, including Britain, Germany, Portugal, and the Netherlands. …On-the-ground competition is small but growing in Europe. In a dozen countries, new competitors have carved out more than five percent of the letter market, and in a handful of countries the share is more than ten percent. …the Europeans are giving entrepreneurs a chance. In response to even the modest competition that has developed so far, major European postal companies have “increased their efficiency and restructured their operations to reduce costs,” according to the EU report. Veronique de Rugy of the Mercatus Center weighs in on the issue in a column for Reason. The Postal Service is a major business enterprise operated by the federal government. Thanks to Congress, it has something many business owners would love to have— protection from competition. Its monopoly on access to mailboxes and the delivery of first-class and standard mail means it doesn’t have to worry about someone offering a better service at a lower price. …unlike private businesses, the Postal Service has access to low-rate loans from the Department of the Treasury, effectively pays no income or property taxes, is exempt from local zoning rules and even has the power of eminent domain. In addition to all these favors, the Postal Service is getting a huge indirect subsidy for it’s unfunded pension system. Congress mandated that the Postal Service start making payments to fund the generous retirement health benefits it has promised workers. This was an important reform because the Postal Service has built up an unfunded liability for these benefits of nearly $100 billion. Ideally, postal workers should be paying for these benefits from payroll contributions rather than leaving the liabilities to federal taxpayers down the road. Sadly, Congress is too timid to take on special interests that benefit from the inefficient status quo, such as postal unions, and won’t support serious reforms… A few years ago, President Barack Obama called for a $30 billion bailout from the federal government, a five-day delivery schedule and an increase in the price of stamps. Unfortunately, that would be a bad solution from the perspective of customers and taxpayers. It also would perpetuate the blatantly unfair competition with companies such as FedEx and UPS. Amazingly, some statists actually want to expand the Postal Service. One bad idea that “reform” Postal Service supporters are pushing is to allow the government service to compete with private firms in other industries, such as banking. That would be hugely unfair to taxpaying private businesses, and do we really believe that such a bureaucratic agency as the U.S. Postal Service could out-compete private businesses in other areas if there were a level playing field? The simple way to think about this issue is that an expanded Postal Service would be like Fannie Mae and Freddie Mac, only able to operate because of special privileges. Shane Otten, writing for E21, has an “undeliverable” message for the Postal Service. …the United States Postal Service (USPS)…an independent agency of the U.S. government, …has exclusive control over the postal system. Like every other government monopoly, it has lost money—$56.8 billion since 2007. The Postal Service is a smorgasbord of common government failures, including high labor costs due to unions (including the American Postal Workers Union, the National Association of Letter Carriers, and the National Rural Letter Carriers’ Association), congressional burdens restricting needed changes, unfunded pensions… Postal workers earn between 24 percent and 36 percent more than comparable workers in the private sector. Because of this, labor costs represent approximately 80 percent of all expenses incurred by USPS. For comparison, private delivery service UPS’s labor costs only make up 62 percent of expenditures, even though UPS is unionized. And at union-free FedEx, labor costs come in at just 38 percent of total operating expenses. Shane echoes Veronique’s argument about the Postal Service’s dodgy approach to pensions. …the Post Office has not made a prefunding payment since fiscal year 2011. …the Postal Service pays nothing in federal, state, and local taxes on income, sales, property, and purchases. This saves the agency over $2 billion each year, giving it a major advantage over private competitors. The USPS is also immune from zoning regulations, tolls, vehicle registration, and parking tickets. …The Postal Service…can borrow money from the Treasury at a reduced interest rate. …borrowing at this artificially low rate is equivalent to a subsidy of almost $500 million. By the way, I got castigated for saying it was a “bailout” when Congress said it was okay for the Postal Service to skip payments for employee pensions. I was basically correct, but should have referred to it as a “pre-bailout” or something like that. The bottom line is that there’s no reason in a modern economy for a government to operate a business that delivers pieces of paper (and more than it would make sense to have government deliver pizzas). Indeed, this is such a slam-dunk issue that even the Washington Post is on the right side. P.S. For what it’s worth, the Postal Service actually is constitutional. It’s one of the federal government’s enumerated powers. But the fact that the federal government is allowed to maintain postal service doesn’t mean it’s obliged to do it. P.P.S. Here’s my only example of Postal Service Humor. P.P.P.S. Though if you have a very dark sense of humor, you may laugh at the “action” of this postal employee. I think he may deserve a retroactive promotion to the Bureaucrat Hall of Fame. Here’s a great snarky comment from Jimmy Kimmel. Jokes like this are funny because we’ve all experienced he misery of waiting in a line at the Post Office or DMV while bureaucrats chat with each other and otherwise goof off. The U.S. Postal Service announced plans to close an additional 2,000 branches after losing $8.5 billion. Maybe in retrospect, making people wait in line while you slowly finish your bag of fiery hot Cheetos isn’t such a good idea. 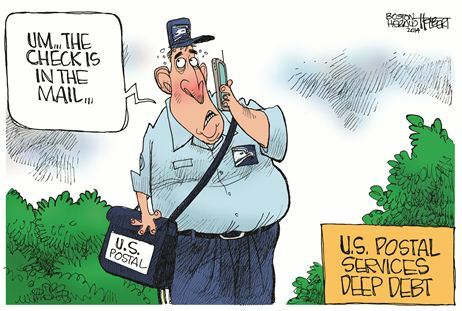 Of course, when taxpayers bail out the Postal Service, the joke will be on us, but let’s not think about that right now. Instead, let’s dream that the government-imposed monopoly on mail delivery will end and the private sector takes over. Heck, even the Washington Post has acknowledged this is the right direction. A group of Postal Service employees in Columbus spent five days in late May and early June being paid to do no work. A supervisor told them to stay in an area of the processing and distribution center near Port Columbus. The nine men played cards and took naps. One of them brought in coloring books, and they had a contest to see who could make the prettiest picture. They all earned their regular wages, $20.58 to $26.34 per hour. This was the latest move in a labor tangle that began with the Postal Service trying to save money. …Months of negotiations and legal filings followed. In May, a Postal Service attorney argued to a board administrative judge that the appeals were now moot. The truck drivers had been given their driving jobs back, the attorney wrote. Except that was true only on paper, say Kidwell and the eight other drivers. They weren’t driving trucks. They were playing cards and having a coloring contest. They spent a few days training to be letter carriers, a job they wanted even less than mail handler. But they never drove trucks. Letters from the Postal Service to the drivers also make it clear that they would be “drivers” for one, two-week pay period only. Then, “you will be placed into the Letter Carrier Craft,” said the letters, signed by Marvin B. Coleman, the manager of labor relations for the Columbus Postal District.